Aprilia has announced that they will make a return to MotoGP in 2016. The company that last raced in MotoGP in 2004 will make a return to the sport after a hiatus of 12 long years. During its time away from MotoGP, though, Aprilia has managed to find success in other forms of racing, primarily the WSBK championship, having won the title in 2010 and 2012 as well. The company's plans to return to MotoGP were announced at the EICMA show in Milan, where Roberto Colaninno, the chairman of Piaggio declared that Aprilia intended to make a return to MotoGP in 2016, and that the company would use the subsequent two years that would lead up to the 2016 season to prepare for a title assault. While Aprilia was one of the first teams to pull out of MotoGP, along with Kawasaki and Suzuki, the team has had some amount of presence in the championship since 2012, thanks to the advent of the Claiming Rules Team regulations. In fact Aprilia has won the CRT class with Aleix Espargaro astride the ART RSV4 in the past two seasons. There has been no news yet as to whether or not the Italian manufacturer will continue in the WSBK championship once it makes its return to MotoGP. 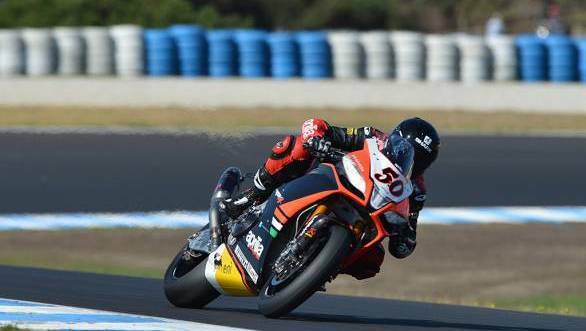 However, for the next two seasons of the superbike championship, riders Marco Melandri and Sylvain Guintoli will pilot the motorcycles in the marque's official factory WSBK team.